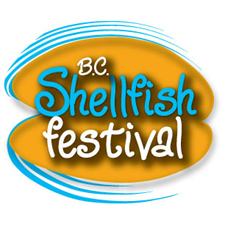 Comox, BC – Shellfish lovers have the chance at winning one of two getaway contests to the BC Shellfish Festival this June in the seaside town of Comox to enjoy all the sights, sounds andflavours at the largest shellfish festival on the West Coast. Deadline to enter is May 16, 2011Entry details at: http://www.discovercomoxvalley.com/promotions/contests.htmMore information about the festival and all the events taking place can be found on ourwebsite at http://www.bcshellfishfestival.ca and our FB Page at http://www.facebook.com/BCShellfishFestival. Well, summer is here for sure-at least in the produce department, if not outside! This is our favourite time of the year. We get excited by every delivery; it’s like Christmas every week. We can’t wait to break into the boxes to see what new goodies we have received. Asparagus is done, as are fiddleheads and mache. But, then there are other treasures to be had: baby potatoes, baby carrots, strawberries, lettuces,green beans and baby zucchini… Oh, it’s hard to know what to eat first!! We are planning and setting up so many things for the coming year. It’s too bad there are so few hours in the day to get everything done. As many of you know, we are working on a website as one of our big projects right now. It is taking longer than expected as we want it to be really great. There are just so many things we want to cram onto the site, but we have to pick and choose what we do put on it, so that it is useful and entertaining and interactive for YOU. And it really is challenging to figure it all out! If there are particular things that you think you would like to see on the site, please let us know. Right now, if you have food photos or recipes featuring local goodies, feel free to send them in to us to use on the site. The more the merrier! Here’s an idea: Serve the radish roots in the French fashion: dip them in butter and kosher salt and eat them with buttered bread for breakfast! The first year and a half have flown by, and we sure have learned a lot! We are taking stock of what we do well, what we need to improve, and what else we want to accomplish in the coming year. (That’s where all the thinking and planning come in…) We just have to work really hard at making at least half of our dreams into reality now. So, here is the first newsletter as part of one of the things we want to make happen this year! Let us know what you think! If it’s great, let us know. If it stinks, we suppose you can tell us that too. Till next time, thanks for being part of the Brambles experience with us. We couldn’t have done it without you! What are the primary products you offer? A wide variety of fruits, vegetables, fresh cut daffodils, bulbs and upick crops. Fresh cut daffodils from organic, bio-diesel run Vantreight farms, Vancouver Island, B.C. Please describe your production methods or farming practices, particularly those that are distinguishing or unique to your business. We are utilizing organic methods and are applying this year for organic certification for our 15,330 m2 (165,000 sq.ft.) state-of-the-art greenhouses and land adjacent to the greenhouses totalling approx 6.5 acres with further certification planned for the future. Our packing facility is second to none with a 4650 m2 (50,000 sq.ft.) warehouse processing plant, 8 cooler units totaling 1,189 m2 (12,800 sq.ft) of cold storage, shipping and receiving areas with 3 loading docks with room for further expansion. Future plans include the use of bio digesters for the creation of heat and power to grow food all year round while significantly reducing GHG’s for the region. What inspired your choice for this career? Aside from carrying on our family farming legacy, I was personally inspired to choose the farm as a career because of our farm’s ability to positively contribute to the community and increase local food security on Vancouver Island. Why do you sell to Brambles? The more local businesses support local agriculture by buying from the farmer the better off we all are. Do you believe that it is important to shop locally? Parksville, BC – On June 27th, Food Fight! The Battle for Brunch, Variety – The Children’s Charity’s brand new fundraising event, brought together some of BC’s finest chefs in a battle for best brunch. Guests sampled each deliciousvoffering and cast their ballot to declare one chef the Food Fight champ! Close to 300 foodies and their friends enjoyed avgorgeous harbour front view at the Vancouver Convention Centre. Event contenders were the Executive Chefs from LIFT Bar & Grill, MARKET at Shangri-La, O’Doul’s Restaurant and Bar,River Rock Casino Resort, YEW Restaurant at the Four Seasons Hotel and the Cedar Room at Tigh-Na-Mara SeasidevSpa Resort. Sweet Potato Waffle with Ginger Peach Compote. Now on Tigh-Na-Mara's Breakfast Menu. 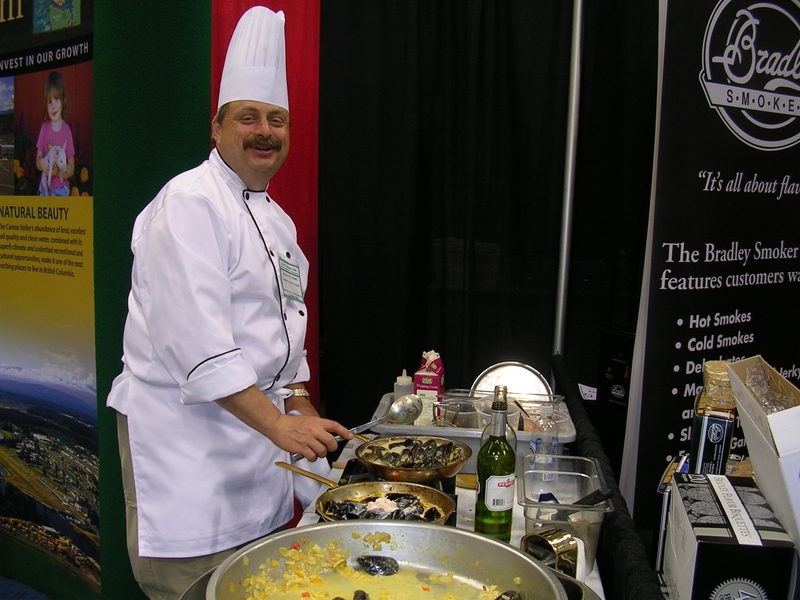 After the ballots were cast Tigh-Na-Mara’s Chef Eric Edwards was declared the Food Fight Champ! Chef Eric prepared delicious Seared Qualicum Bay Scallop on Warm Nanoose Edibles’ Spinach Salad and Sweet Potato Waffle with Ginger Peach Compote. The Waffle is now a featured item on the Cedar Room’s Breakfast Menu. used by Variety to support children in British Columbia who have special needs. Variety – The Children’s Charity raises funds and distributes grants to inspire hope, enrich lives, and build a better future for children in British Columbia who have special needs. Since 1965, Variety has raised over $155 million for children and families in the province. 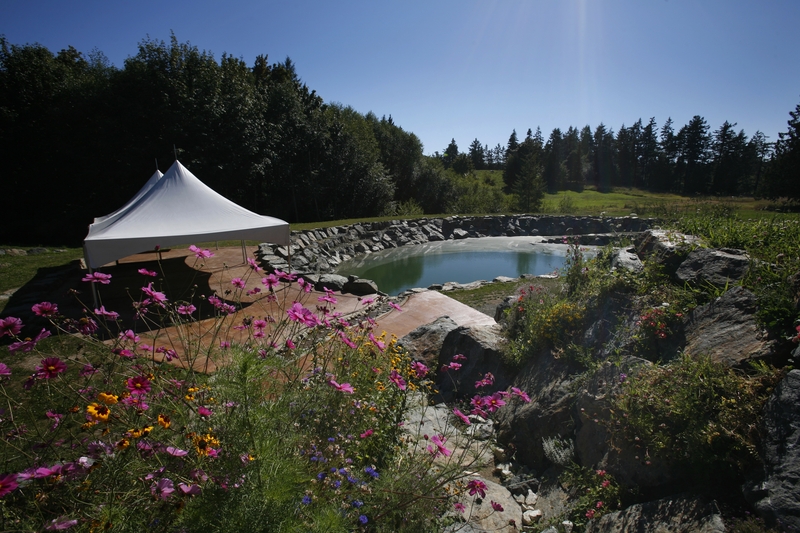 Centrally located on Vancouver Island, Tigh-Na-Mara Seaside Spa Resort captures the very best of the West Coast. Featuring 192 unique log-style accommodation units set in 22 acres of forest beside the ocean, a full service spa and award winning West Coast cuisine. Tigh-Na-Mara is the natural choice, rated with 4 Green Keys. Fort Berens Estate Winery Investors See Gold In Lillooet, B.C. Proprietors Heleen Pannekoek and Rolf de Bruin, newly arrived from Holland with their young family are pleased to welcome the gold company executives into their ambitious and exciting new business. 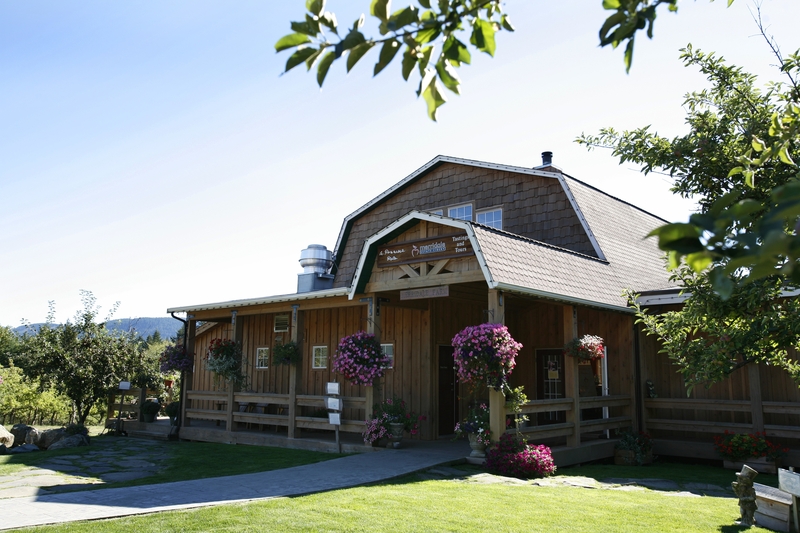 Fort Berens Estate Winery, first in Lillooet, B.C. 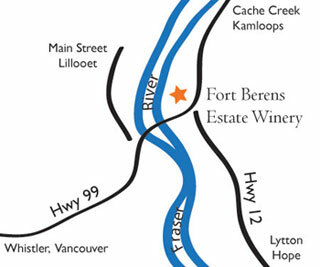 LILLOOET, BC (May 30, 2010) – Fort Berens Estate Winery (Fort Berens), today announced that it has attracted the venture capital necessary to accelerate its business plans and build a new winery facility located in Lillooet, British Columbia. With the new funding, Fort Berens will commence construction of a new wine making operation and shop on its property to produce and sell wines from grapes grown on the winery’s initial twenty acre vineyard. The first crop of grapes is expected in the fall of 2011. Fort Berens is located in historic Lillooet, at Mile 0 of the Cariboo Trail and rallying point for the Cariboo Gold Rush. The winery was established on the east side of the Fraser River at Lillooet in early 2009, exactly one hundred and fifty years after the Hudson Bay Company started construction of a trading post in the same location under the same name. The fort had been designed to serve the thousands of prospectors who flocked to the Lillooet region in the mid-1800’s in search of gold. However, it was never completed and the fertile river bench was instead used for the growing of melons, tomatoes and alfalfa. Fort Berens Estate Winery, Lillooet, B.C. Located in the magnificent Fraser Canyon, this historic site is now home to Fort Berens Estate Winery, Lillooet’s first commercial vineyard and winery. In keeping with the pioneering spirit of the Gold Rush era, the proprietors of Fort Berens Estate Winery are forging a new and unique wine experience in British Columbia, offering superb, distinct, hand-crafted wines. The investors in Lillooet’s newest venture are no strangers to the pursuit of pioneering. Hugh Agro, Sean Harvey and John McConnell are Toronto and Vancouver-based mining executives and members of the Board of Directors of a TSX-listed gold exploration and development company. As investors in Fort Berens Estate Winery they have come to Lillooet looking for a different kind of gold, of a liquid variety. Fort Berens Estate Winery currently offers five select wines under their label, made from grapes sourced in the Okanagan. They are available for sale in the existing on-site winery and tasting room and also in a number of specialty wine stores in Vancouver, Whistler, Kamloops and Lillooet. A stay in Comox Valley, Vancouver Island would feel black and white, gray even, without dining out at least one meal – if not daily – at Locals Restaurant in Courtenay. Where the colors of nature greet you at every turn, this is a Valley bursting with vibrancy. If there’s one thing nature loves, it’s color: The eye-popping yellows and purples of Spring flowers, the deep greens of leafy vegetables, the dark reds of vine-ripened tomatoes, even the fleshy pinks of fresh salmon. “Locals – Food From The Heart of the Island” is the pride and joy of Chef Ronald St. Pierre who, with his wife, have created a dining experience that represents the culinary best of Vancouver Island’s Comox Valley. To walk through Locals’ doors is like walking into an Island Chefs Collaborative Farmers Market turned restaurant. The exterior is humble enough. In fact, the praises that were sung about the restaurant and Chef St. Pierre, his philosophy and his passion for fresh, local ingredients did not prepare me for finding the restaurant to be the cornerstone in a Courtenay strip mall. As a first-time visitor to the Island, at every turn I was struck by the quaintness and charm of old farms, wooden buildings, even Courtenay itself is a picturesque little town entirely walkable with cheerful cafes and shops that line 5th Street, its downtown core and the center of Comox Valley. But now I know why people had failed to mention the restaurant’s exterior – once you’ve eaten there, what’s outside doesn’t matter. The restaurant’s interior is tastefully appointed, with a second room that has large booths for a private dining experience. But truly, the only thing you remember is how good the food is! Chef Roland St. Pierre is a pioneer in translating “locavorism” into the driving philosophy behind a successful restaurant. 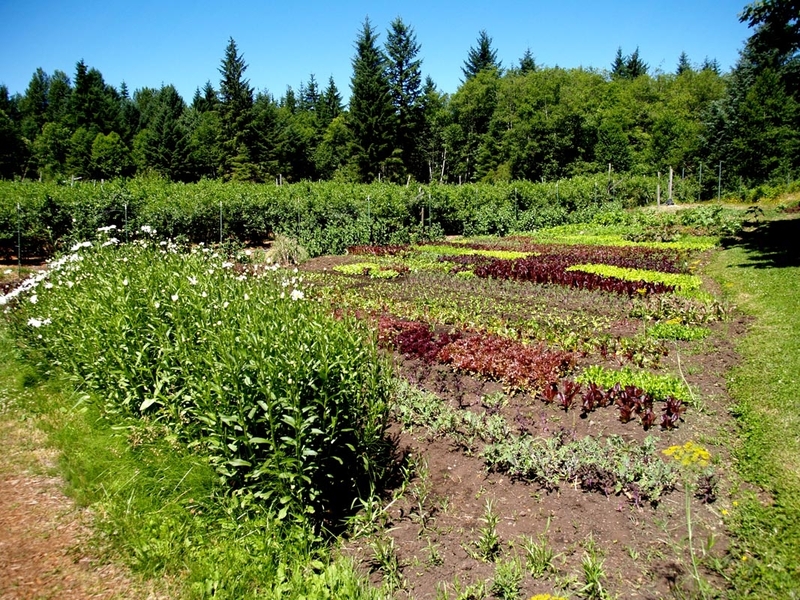 Mind you, on Vancouver Island, locavorism is the common mind-set and to do otherwise is, well, frankly absurd. 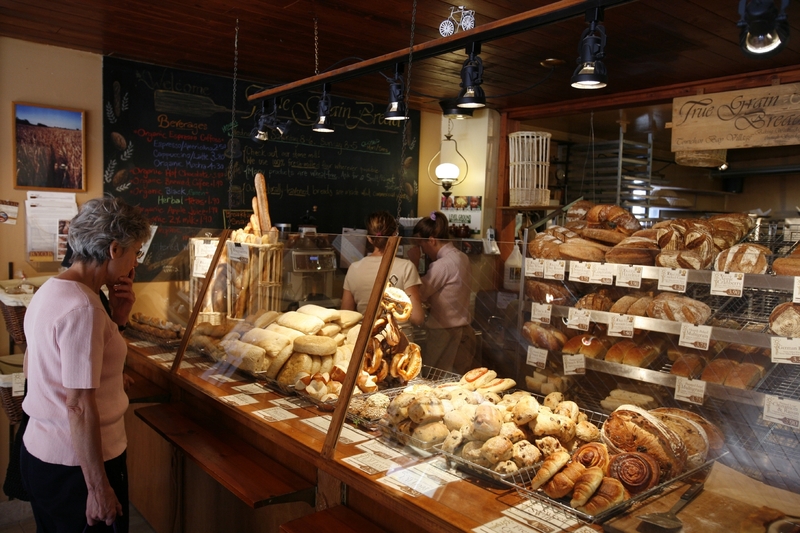 The Comox Valley especially is an abundant bread, fruit, cheese, meat and seafood basket. It could easily be named “Valley of Plenty” so abundant is all the fresh quality fare within arm’s reach. The Locals’ website explains their philosophy and reasoning, such as, “Buying habits are shifting with ‘food currently tied with health as our 4th top spending priority.’” It’s definitely worth reading if you at all consider yourself a foodie. Or a greenie. So Chef Roland and his wife got to talking with local farmers and growers and saw what could be directly sourced for their table. They create their seasonal menus around the ingredients available. Pattison Farms, for example, supplies their fresh greens such as baby spinach, heirloom tomatoes and spicy mustard greens. Beaufort Vineyards supplies them with wine, as do other local vineyards like Chase & Warren Estate Winery and Cabrea Vineyard & Winery as well as the many vineyards just a bit south in the Cowichan Valley. As part decoration and as part tribute, Chef St. Pierre hangs his walls with portraits of the farm-to-table suppliers he sources his fresh, local ingredients from. 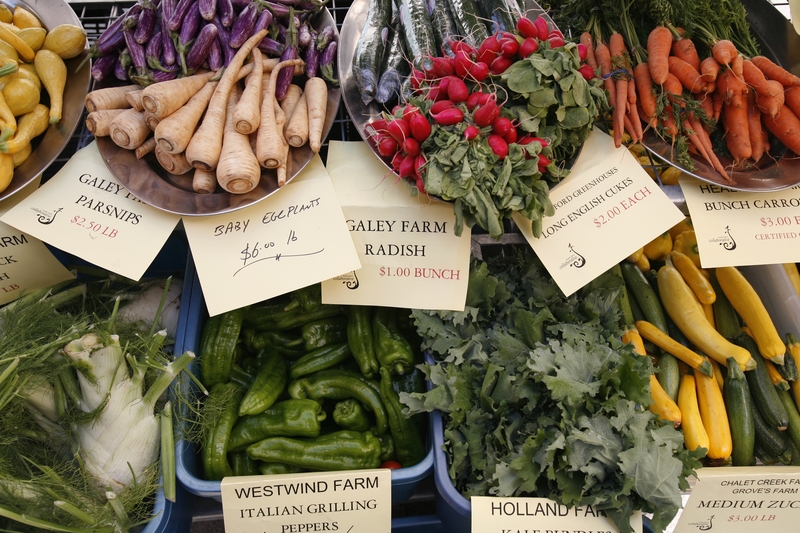 If you are keen to do a tour of the Valley’s prime growers for ingredients ranging from pork to duck, tomatoes to broccoli florets, goat cheese to mussels to ancient method balsamic vinegars, take a look at Locals’ walls, jot down the names and then work your way down the “wall.” With this itinerary, curated by Locals’ Restaurateurs Chef and Mrs. St. Pierre, you are guaranteed to enjoy a thoroughly fresh and authentic introduction to some of the Island’s star growers and local farmers. The price points are also exceedingly reasonable. More often than not Locals’ has a Prix-Fixe or Market Sheet menu to order from. Depending on the season, for $35 you can have a seared duck “prosciutto” appetizer, a main-course of Bison (or fresh caught salmon) and a medley of desserts including fresh off-the-farm raspberry mousse. Or you can order a’ la carte from the menu. Either way, you’ll leave exceedingly, freshly satisfied. Just in time for the Okanagan’s Spring Wine Festival, John Schreiner’s 3rd edition of John Schreiner’s Okanagan Wine Tour Guide, is out in book stores May 1st 2010. Schreiner’s guides to wine offer an approachable and friendly introduction to the region’s winegrowers, winemakers and proprietors of the ever-expanding Okanagan Valley wine community in addition to the wines themselves. In the book’s Intro, Schreiner tells you upfront that he didn’t write the book for “technicians,” but rather for people who enjoy drinking wine and for the people who make the wine that we enjoy drinking. “Wine is not a clinical product to be separated from the people who grow it. The art in wine is what attracts both consumers and wine growers,” writes Schreiner in his Introduction to the book’s 3rd edition. The first edition was published in 2006 and already there are a good many new additions to the Okanagan winery fold, with more wineries planned and building underway. “In most of the tasting rooms I have visited, everyone is having fun, especially during wine festival time,” writes Schreiner, reminiscing, “During the Okanagan’s Spring Wine Festival 2005, I was lounging on the deck at Jeff and Niva Martin’s La Frenz winery, savouring a glass of Shiraz…”. This is the context, a context of place, time and people in which John Schreiner uniquely can immerse you when it comes to the distinctive regions and wines of the Okanagan. His perspective dates back 35 years when he first began touring the region in search of good wines. The Okanagan’s current vibrant wine industry really only dates back to the late 80’s/early 90’s so Schreiner’s insight is one that lends itself to developing right alongside with the then-nascent wine industry of the region itself. 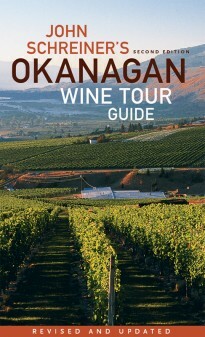 The book delves into the various regions of the Okanagan. 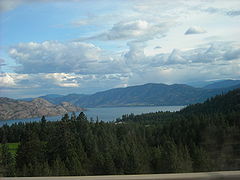 The Okanagan Lake itself is 135 km. stretching more or less N-S from Penticton up to Salmon Arm. 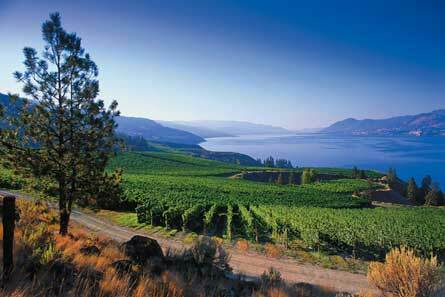 The wine growing regions are dotted all along there and stretch down, past Skaha Lake, into the Golden Mile and Black Sage Bench areas of Oliver and then down into Osoyoos, around Lake Osoyoos which spans the U.S./ Canada Border, and then a bit West over into Keremeos and Cawston, known as the Similkameen Valley. His book beguiles you with the charms of Naramata Bench, a wine-growing region overlooking the expansive, beautiful and pristine Lake Okanagan; delves into the people with a dream some of whom are just selling their first ’09 vintages in time for Spring Wine Festival 2010, kicking off today in the Okanagan. He gives you a brief background on valley influentials such as Elias Phiniotis, Ron Taylor, and Howard Soon. He also takes you into the past with historical anecdotes about B.C.’s oldest continually operating winery (since 1932), Calona Vineyards, and forward into the future sharing with you certain family’s plans to plant on the northern perches of Salmon Arm, where the nearest vineyard at Larch Hills is at B.C.’s highest elevation of 700 meters/ 2,300 feet. Most importantly, however, Schreiner will introduce you to the people who have chosen to build their lives around the vine, to make the best of the hand that Mother Nature deals them season after season. With this kind of an introduction to a region’s wine, you can’t help but fall in love with the ones that please your palate, and keep returning year after year to see what magic has been bottled in this year’s new vintage. *Note Book’s Wine Speak Glossary at the end is very helpful and is sure to make you sound like you know what you’re talking about when you’re in the Tasting Rooms. 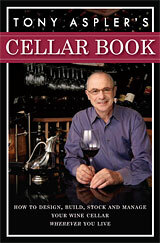 John Schreiner’s Okanagan Wine Tour Guide (2010), 161 pgs. according to the study, it is. But millions of grinning people from all around the world that solemnly swear by the steamy power of this slimy sea delicacy have known this for ages. What we do know is that this study supports a more natural way to kick your love life into high gear; likely with fewer side effects. straight out of fairy tales. Double-check. Unspoiled nature. Check. Oysters aplenty. Check and check. 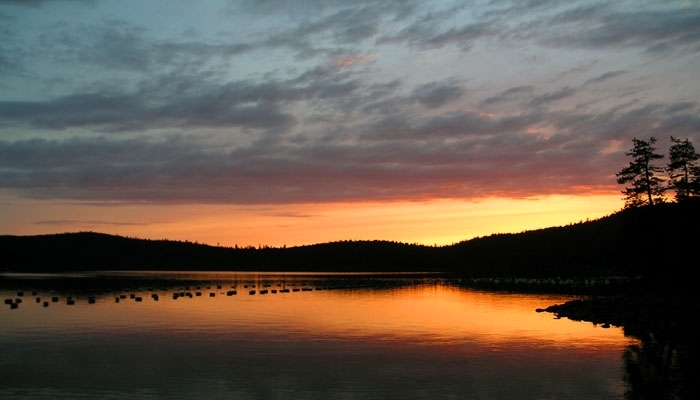 wanting the very best in outdoor adventure, mental and physical rejuvenation, and romance. The journey starts with the love boat. Not the one with Captain Stubing, Gopher and Isaac, but whichever boat you choose to get yourself, and your loved one here. BC Ferries operates regular sailings year round, or perhaps a romantic private charter is more what the love doctor ordered. No better way to impress your date than by showing up to his/her door in a private boat. Check. If your love happens to get sea sick easily, no need to surrender the night, there are available alternatives. Pacific Coastal Air will deliver you to Powell River from Vancouver in less than 30 minutes. Of course, there are also float planes that would happily fly you into any of the many surrounding area lakes in premiere fashion. Once on the Sunshine Coast, the oysters take centre stage. the patio with a backdrop of glistening water and towering coastal peaks. The oysters are starting to kick in. romance is further enhanced with live music, sometimes straight from the guitar-wielding hands of the Executive Chef. By now, your senses are likely overwhelmed in a state of oyster-induced bliss. complex. 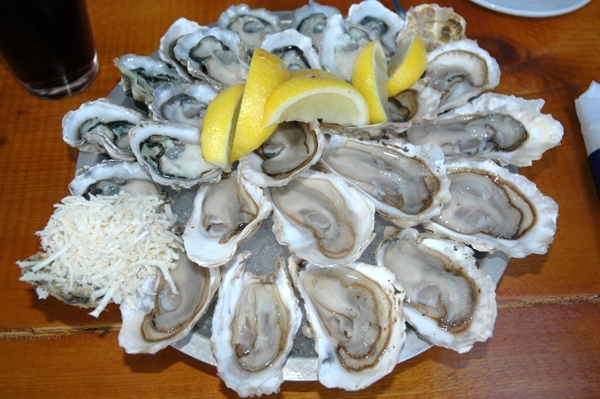 The tour appropriately ends with a seafood feast that includes Oysters Grilled in Salsa with Jalapeno Cheese, Locally Smoked Oyster Pâté, Oyster Seviche, Oyster Baguette, Grilled Oysters with Pesto, and Oven Baked Parmesan Oysters. You’ll be asking for your room key before you can say Oysters Rockefeller. Romance is in the salty-air. If you yearn for a more natural approach to sexual therapy, you might want to consider the Sunshine Coast in lieu of filling your next prescription of the little blue pill at your localpharmacy. Darren Robinson is a freelance writer and professional photographer from Powell River, on BC’s Sunshine Coast. He can also be found some afternoons at Powell River Tourism. His images can always be found at www.darrenrobinsonphotography.com. Vancouver Island could easily be nicknamed Ceres Island. “Ceres,” Goddess of agriculture and growth, has blessed the Island many times over. For me “the island” was somewhat shrouded behind a veil of mystique. For starters, you have to take a Ferry to get over to it. And then there were the people on the “Mainland,” that is, Vancouverites, mostly, who often refer to “the island” as a place they retreat to when life feels too fast. Correction number one: The B.C. Ferries are more like cruise ships, with spectacular scenery, seamless drive-on, drive-off, and roomy, plentiful seating. There’s even talk of spa services being added to the on-ship diversions. Correction number two: Yes, Island pace is a bit slower. However, when you are a culinary traveler searching out the island’s delectable gems, there’s little rest for the adventurous! Little under an hour North of Victoria, in a pastoral setting nestled between Mill Bay and Cobble Hill, there is Merridale Estate Cidery. Merridale, the first cidery on the island, is owned by Rick Pipes and Janet Docherty who readily admit that the undertaking is a “labor of love” and has been since they first bought the 20-acre property in 2000. No one else at the time was doing cider on the island. So Rick, Merridale’s cider maker, got in touch with Peter Mitchell, the U.K. -based “cider guru” to teach him some tips. Aranda Page is a Foodie and a Writer – also a culinary tourist in the world of gastronomic and oenological delights! Tria is a triumvirate of Chef Kathy Jerritt, and husband and wife team Marla Limousin and George Ehler of Nature’s Way blueberry farm and Blue Moon Estate Winery. British Columbia’s (other) cash crop is blueberries. But few have had the vision to make wine from their blueberries as George of Blue Moon Estate Winery has done. “We were lucky,” explains Marla, who also teaches a Cultivating Your Garden class at North Highland College on the island,”When we bought the farm about a decade ago, it was just about the time that there was this run on blueberries. So we quickly found ourselves sitting on a cash crop,” she says with a shrug and a smile. Nature’s Way Farm, soon to be know as Blue Moon Farm, has about 2,000 blueberry bushes that produce about 30,000 pounds of blueberries from about 6 acres. They also cultivate an herb and vegetable garden on site in their greenhouse that Chef Kathy uses in her on-site cooking classes and demonstration dinners. On a recent afternoon while walking the property with Marla and Kathy and meeting their resident four llamas, Kathy picked a leaf of the tender arugula and mustard greens for a sampling of the kinds of fresh ingredients she uses for her dishes. What a difference fresh makes! My eyes started watering from the spiciness of the mustard greens; Wasabi is grown fresh on the island but if you want to kick your taste buds out of this world, chomp on a leaf of Kathy’s mustard greens! Now that Spring is warming up and summer is around the corner, make a note of these important Full Moon Feast Dates: Milk Moon, May 27; Strawberry Moon June 27; Mead Moon July 25 and then there’s Wort Moon and Corn Moon to follow in August and September respectively. For a day of delight, make your way to Cow Bay. 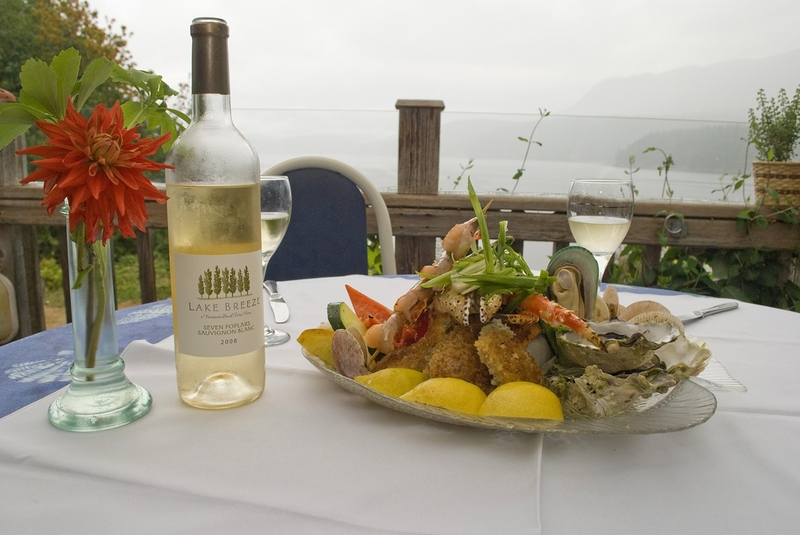 This little seaside village boasts some of Vancouver Island’s star culinary attractions. They are: Hilary’s Artisan Cheese, True Grain Bread, and newly refurbished Cowichan Bay Seafood. The Cowichan Valley Regional District is also home to Fairburn Farm, the decade-long Slow Food and Water Buffalo mozzarella cheese farm championed by Mara Jernigan and the Fairburn Farm family. Just a meandering island country road down from there is Blue Grouse Vineyards and Winery, one of the founding estate wineries of Vancouver Island. There’s also the Cowichan Valley Meat Market [and Quist Family Farm processing], an important component in ranking as a Slow Food Community, as Vanessa, on Cowichan Bay’s Slow Food Board, is quick to point out, “Everyone can grow their own vegetables and keep their own chickens, but what about the protein source?” she rhetorically asks, during a discussion about Vancouver Island’s unique on-island meat processing facilities. Cowichan Bay is a small unincorporated area, more a village than a town, that is tucked inbetween Victoria to the South and Comox Valley to the north. 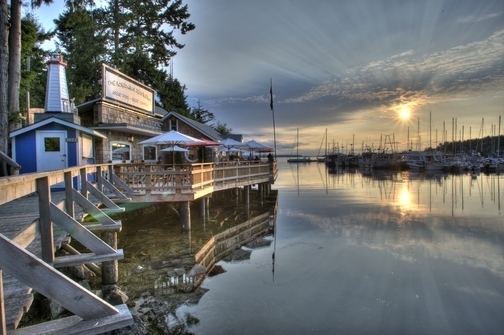 Salt Spring Island is just a stone’s throw away across from the neighboring Genoa and Maple Bays. If you’re into “Slow” then you probably already know that Cowichan Bay is the first North American community to be awarded the Citta Slow designation; a designation they won only just last August and due to the focused efforts of Mara from Fairburn, Hilary Abbott of the fore-mentioned cheese, Bruce of famed True Grain and Vanessa Elton of Affinity Guesthouse. Full membership of Cittaslow is only open to towns with a population under 50,000. To qualify as eligible, a town must score at least 50 percent in a 52-point Citta inspection – Cow Bay scored 93 percent, one of the highest scores in the entire International Network. This little village scored particularly high for their environmental policies and also, since Vanessa and her husband Dwight who run Affinity Guesthouse had something to do with it, friendliness as well. Check in to your B&B as only the view from a private residence will afford you the real glimpse of the Bay’s pastoral setting. The views from the two rooms at Affinity Guesthouse look out onto a river, a green and lush backyard that opens up onto the Bay and trees that appear to have popped out from the pages of a picture book. Likely Dwight will be jumping off of his tractor to greet you as you pull up. Don’t be swayed by the neighboring homes as you find your way to their off-the-beaten path Guest House, the destination at the end is well-worth driving through the few brambles. Interestingly, for most Slow Food communities, protein is the challenging aspect as many regions do not have ready access to meat processing plants. The island, with their ingrained sense of “food security” has this aspect licked, but what proves to be a challenge to these native foodists is grain. 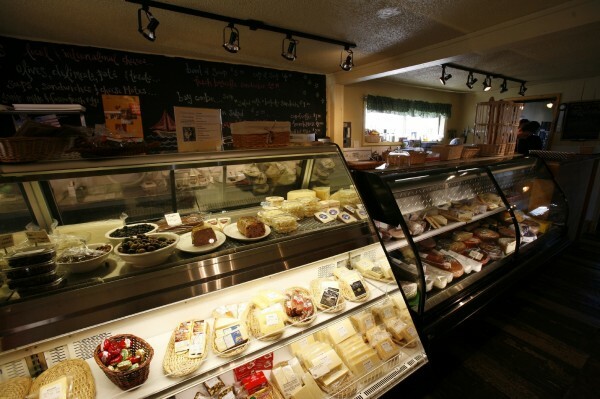 Hilary’s Cheese is a wonderful stop to stock up on picnic supplies such as his freshly made goat cheeses and the deli meats he keeps stocked behind the glass counter. 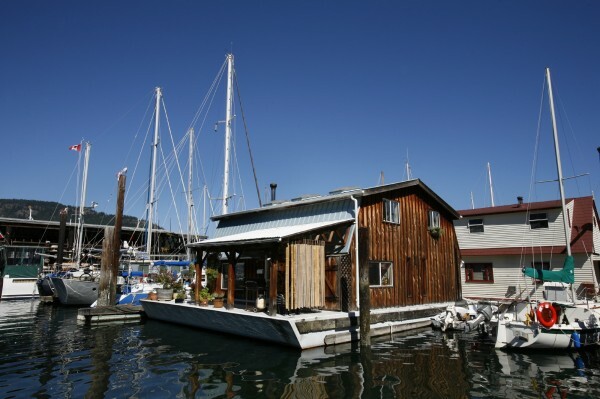 It’s also a great place to grab a bowl of soup and sit at one of the tables in the lunch room overlooking Cow Bay’s “float homes,” (not to be confused with houseboats, an altogether different animal). If you think to call ahead and you get lucky scheduling-wise, we’ve heard that Hilary will give Cheese Tours from time to time for the chosen. Just a couple doors down and past a potter’s studio and other artist attractions, is Cowichan Bay Seafood. Recently bequeathed a new coating of paint, it’s one of the freshest, cleanest fish markets you’ll find anywhere. Fresh halibut, now in season, as well as crabs, shrimp, scallop and, yes, fresh oysters and mussels, are all ripe for the picking. Just a short drive up the road, across the main “highway” and down a country lane you’ll find Hans at Blue Grouse Winery and Vineyards. “True and healthy varietal wines,” is how Richard Kiltz and his father describe their wines. On a picturesque sloping estate, just a few kilometers from Fairburn Farm, the Kiltzes established their vineyards in 1989. “Ja, we came to the island in 1989,” Hans will tell you, “At that time, there were 28 wineries in all of British Columbia. Eight of them were owned by Germans.” Richard, trained in the tradition of oenology in Germany, credits the pure air and spring water with providing the raw stuffs that make the grapes that great wine comes from. Ortega is a grape they’ve planted since the beginning and for a splash of freshness, drink a glass and take home a bottle of Blue Grouse’s Siegerrebe, an offspring of Gewurztraminer and Madeleine Angevine…mmm!.. rose petals and peaches. Www.bluegrousevineyards.com The Sixth Annual Cowichan Valley Wine & Culinary Festival happens in September. The grounds themselves are pastoral, picturesque, picture-book like scenery. But not to miss are the greenhouse and nursery where you can pick up annuals, perennials and herbs and the Farm Store where you can buy treats for yourself and to take home such as freshly baked cookies, canning from the Kitchen Program – a program that Dwight and Vanessa volunteer for – and fresh eggs from “the girls.” You’ll want those for your breakfast in the morning. All purchases go toward supporting the running of the farm. If you happen to be on the island in Spring, absolutely not to miss is the Stinging Nettle Festival at Fairburn Farm. Stinging nettle dates back to ancient times as a food source, and even farther back as a medicinal and clothing fiber source. It contains the most chlorophyll of any vegetable. It also contains 40 percent protein and has higher volumes of vitamins A, C, and D than spinach, even, when cooked, as well as potassium and calcium. 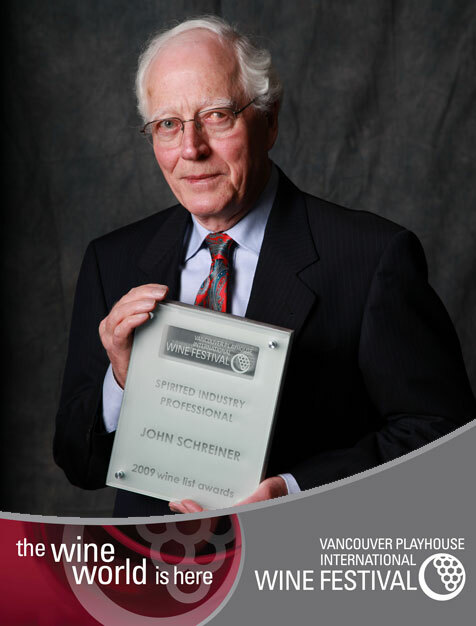 John Schreiner's B.C. "wine Bible." Don’t take the bull by the horns, take him by the tail then you can let go when you want to. no your body needs proteins and other vitamins found in meat. if your going into body building your gonna need a lot of meat because your are going to start eating a lot more like six small meals every day. This domain seems to get a great deal of visitors. How do you advertise it? It gives a nice unique twist on things. I guess having something useful or substantial to post about is the most important factor. Great Blog site. Can I contribute to Local Food And Wine? Notably enjoyable. Keep these reports flowing. what are you doing to make your blog so great? Hi – really good site you have established. I enjoyed reading this posting. I did want to publish a remark to tell you that the design of this site is very aesthetically sweet. I used to be a graphic designer, now I am a copy editor for a magazine firm. I have always enjoyed functioning with computers and am trying to learn computer code in my free time (which there is never enough of lol). 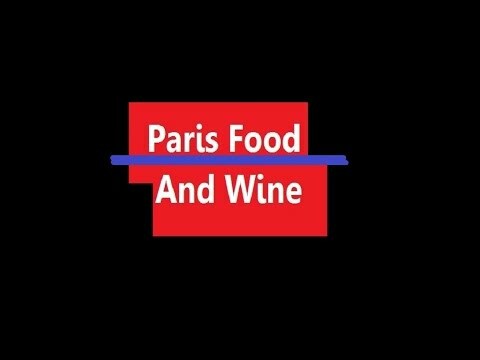 Local Food And Wine is one of the best, the very best, food blogs on the internet!!! Keep up the great blogging! very informative post. Looking more to something like this.Keep up the good work Local Food And Wine! I love getting talks on your blog, it turns fuel presentation and allows people to think like they can become involved in the comment. I tend to agree. It’s a awesome way. At first test run on a lot, he nibbled on our coffeecake. I would like to send you the recipe! He was a little bit knowledgeable about wine. 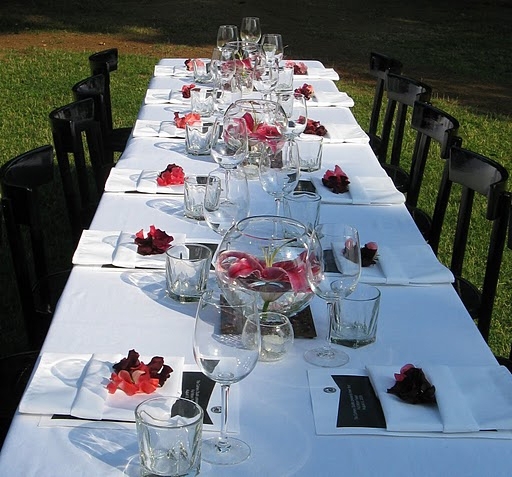 How we pulled off the great meal…well read more on The Room. . It is big enough to warrant a suggestion of more wine! You made various good points there. I did a search on the topic and found the majority of people love your blog. Wow! This could be one specific with the most useful blogs I’ve ever come across on this topic. Basically Magnificent. I’m also an expert in this topic so I can see your effort. Keep up this good work, you have a nice blog over here with much good information! Aw, this was an exceptionally good post. Spending some time and actual effort to create a superb article?but what can I say?I hesitate a lot and don’t manage to get anything done. A motivating discussion is definitely worth comment. I believe that you should write more on this subject, it might not be a taboo matter but generally folks don’t talk about these issues. To the next! All the best!! Hi there! I simply wish to offer you a big thumbs up for the excellent information you’ve got here on this post. I’ll be coming back to your web site for more soon. Howdy! I simply wish to offer you a big thumbs up for the great information you have right here on this post. I’ll be returning to your site for more soon. I am now not sure where you’re getting your information, but great topic. Thank you for excellent info. I simply want to say I am newbie to blogs and honestly enjoyed your page. Probably I’m likely to bookmark your website . You have great articles. Cheers for sharing with us your blog. 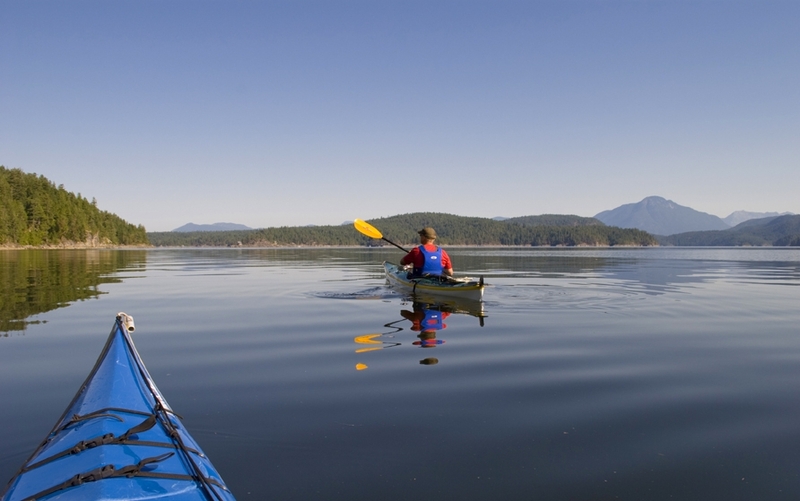 Great information about our exceptional region here in BC, including Qualicum Beach. 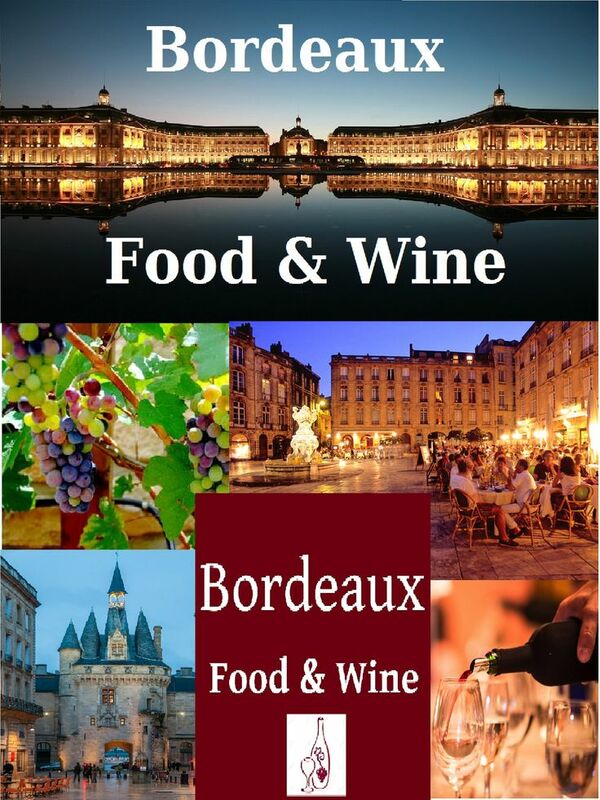 Its a great place to explore and there are so many food & wine events. Perfect for a quiet getaway stay at a Bed & Breakfast.